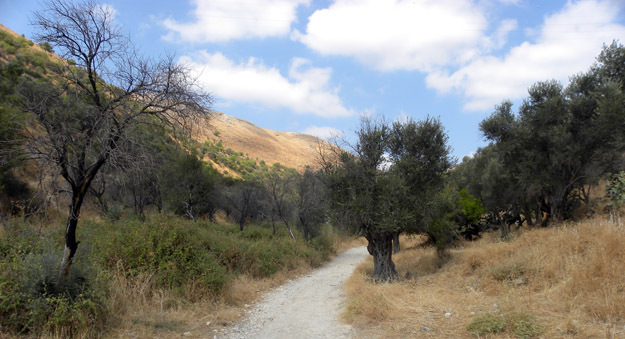 ROSH PINA, ISRAEL–This weekend my friends the Avni family took me on an overnight trip into the Galilee. It was spectacular and highly informative — they called it the “Mark Continues to Discover Israel” tour. The ostensible purpose was to attend a reunion of Noa Avni’s kibbutz school class, but we also took in numerous cultural, historical and geological (of course!) sites. We drove from Mizpe Ramon on Friday afternoon north up the Rift Valley, following the west coast of the Dead Sea and then the west bank of the Jordan River to Tiberias on the Kinneret Lake (Sea of Galilee). 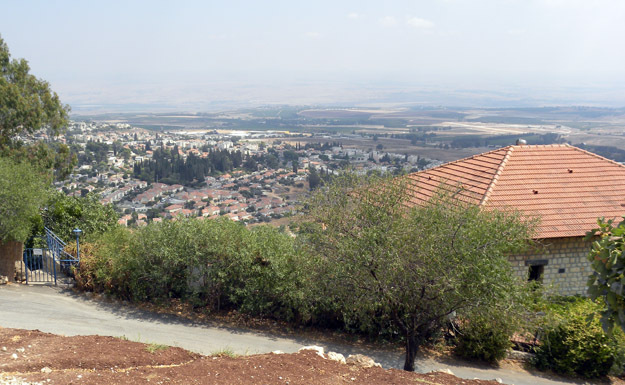 We then continued north in the Galilee to a little town a few kilometers from Rosh Pina. We then had a barbecue dinner and conversations into the late evening before sleeping on mattresses in a grassy square. I asked many, many questions of my new Israeli friends (my Mother would be so proud) and learned much. Looking into the Galilean hills from Rosh Pina along the very old road to Safed. Note the ancient olive trees and the gray rocks of the distant hills, which are Eocene limestones. Rosh Pina (just down the mountain from Safed), talked to a man who runs environmental education programs, and had a long lunch with Yoav’s sister’s family in their hilltop home near Karmiel. We drove back down the Rift Valley to return to Mitzpe Ramon late this evening. Rosh Pina from the Nimrod Viewpoint. I was most impressed by the friendliness and candor of the people I met (I know — it is no surprise that Israelis are candid! ), the lingering damage from the 2006 Hizbollah rocketing of northern Israel (mostly burned forests now and gaps in streets where there were once houses), the complex carbonate rocks which make up most of the hills in Galilee (my rocks in the Negev are much simpler), and the full moon tonight which rose bright red as its light passed through Saharan dust low on the horizon. 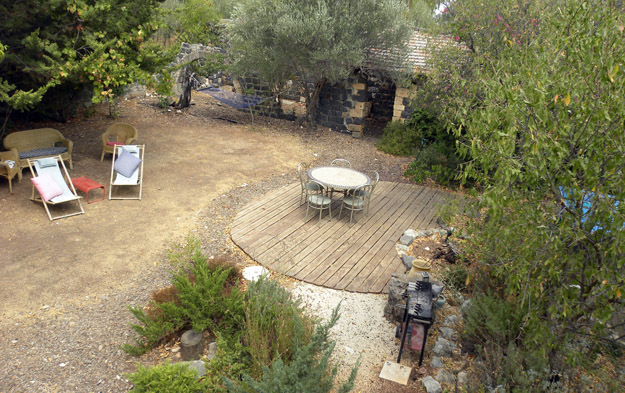 The delightful backyard of an environmental educator in Rosh Pina, Israel. 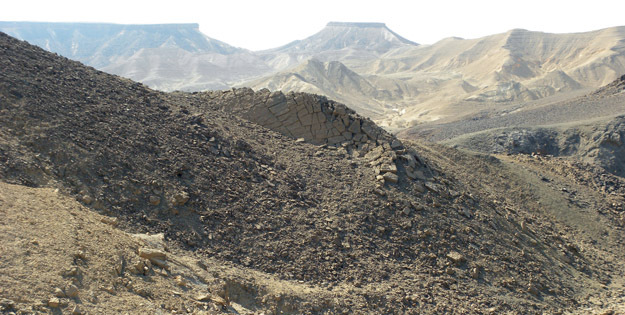 MAKHTESH RAMON, ISRAEL–The Triassic was a time of unusual evolutionary innovations. The Permian extinctions immediately before the Triassic may have wiped out up to 95% of marine animal species, so the survivors had considerable “empty niche space” to fill as they adapted to new environmental conditions with far fewer competitors. The strange clam above is now part of this history. On the left you see a view from above and front of the clam in living position. It has a flattened base which it used to sit on the seafloor with its two valves extended up into the seawater to filter-feed. On the right is a view of the base of this clam showing the junction between the two valves. Note that the valves are not symmetrical as they are in most clams. This clam was an “edgewise recliner”, meaning it sat on its edge (which it flattened over evolutionary time). 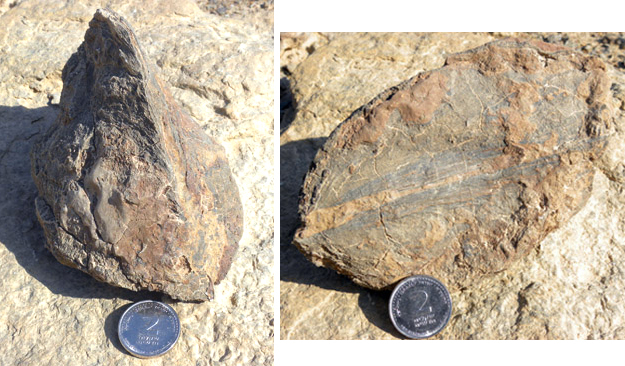 There is no other clam like it in the fossil or living record, and it is found only in one rock unit in the Negev Desert. Allison Mione (’05) studied this clam and its living environment as part of her Independent Study project, and Tom Yancey (Texas A&M University) and I continued to work on it after she graduated. The three of us now have a paper in the journal Palaeontology coming out later this year interpreting this clam as a new genus representing a new family of bivalves. I took the opportunity yesterday to find a few more examples of this unique creature for museum collections. This fossil was not thoroughly described in the past because finding whole specimens is very difficult. We found one spot where the clam-bearing rock unit (the flat, tilted bed in the middle ground of the photo below) was dragged along a fault and bent in such a way that large blocks of the rock collapsed downhill upon exposure, releasing whole fossils. As far as I can tell, this is the only place the whole fossils can be collected (N30.58759°, E34.88685°).